During Mahabharata, there was a time when Krishna went to Hastinapur to hold peace talks with the Kauravas. They offered him grand dinners and hospitable amenities during his stay in Hastinapur. However, instead of choosing such lavish lifestyle, Krishna went to the doors of Vidura for his stay. Both Vidura and his wife Sulabha were devotees of Lord Krishna. Even though Sulabha had never met Krishna, she loved him childishly and uninhibitedly. Her life was different to the common way of a princess and was more like that of the Gopis – transparent, simple, lifestyle without much knowledge of studies or rules of living, all natural and innocent. There are different versions of this tale, but the one that we are talking is the most common one. As Krishna reached to the doors of Vidura, he had been out and Sulabha was taking a bath. Krishna knocked on the door and called out, “Open up! It’s Krishna. I’m hungry!” When Sulabha heard the call, her mind went blank. The one she had been a complete and blind devotee of was on her door and she did not know what to do. She kept thinking if all that was real or if she was dreaming. The only thing that was on her mind was that she had to let him in before Krishna would turn away, be it the dream or the reality. She ran to the door hurriedly and opened the door for Krishna. She was astonished and delighted to see him, and she grabbed his hand and pulled him inside the house. Then she realized that he was hungry, and consumed in that moment, all she wanted was to give. However, she had not realized that she was completely naked. Seeing her love and eagerness, Krishna was shocked too and when she released her hand, he took his shawl and covered the unclothed body of Sulabha. Even when he clothed her, she had not been aware of the action. She went to the kitchen to get something to cook, and all she could find was bananas hung on the rope. She gave him an inverted wooden box to Krishna so he could sit and relax. She peeled off the bananas, and instead of giving him the pulps, she was still in an awestruck moment that she gave him the peel. Right in the moment, Vidura arrived to see the ridiculous scene where his wife was wrapped in a shawl and offering peel to Krishna, while he was seated on a wooden box, chewing the peel merrily. It looked like they both were in trance to Vidura. To break the silence, Vidura coughed when he entered. Sulabha was still in her confused state of mind when she heard the voice. It took some time for her to get back to the reality. Her love was pure, that which was not guided by any protocol, and she loved him without any fear or even respect. It was more of an affection and intimacy that came from long-term of familiarity and the fond of enjoying that bond between them. Krishna too was amused at her actions and the simplicity of love. Vidura was thinking that she might have been crossing the line, and he apologized on his wife’s behalf. He gave him the pulp instead. Krishna replied that the peel was the most delicious meal he had had in a while, and it was the kind of food that he always wanted – the one that was served with love and affection. He even went on to say that the pulp that Vidura had offered was not even half delicious as the peels Sulabha had offered him. Vidura then understood that there is no “right way” to love Shri Krishna. There aren’t any rules or guidance or limitation that one can provide to love Krishna. All that matters is that it should be genuine, and not the kind of love that does not come from the heart. 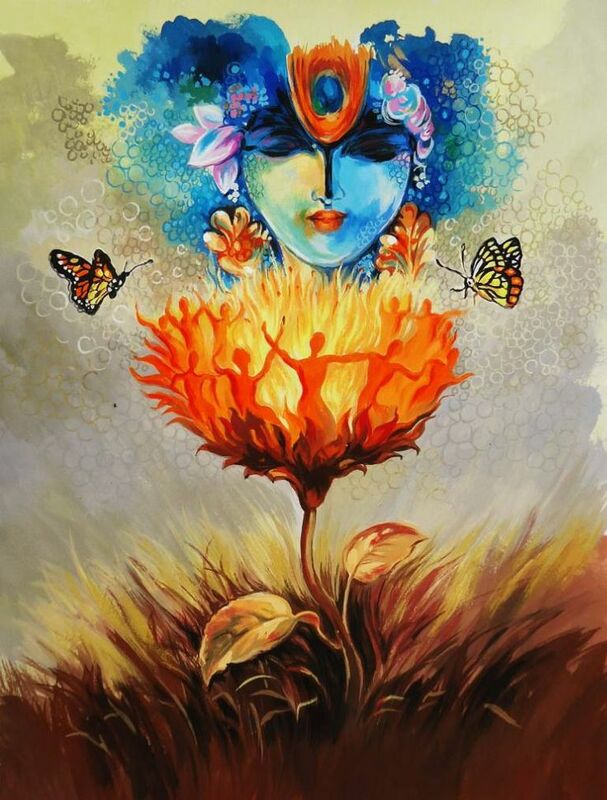 Krishna accepts all sorts of love and returns the love with something too. Also Read : A female led relationships are always awesome, Here is Why !